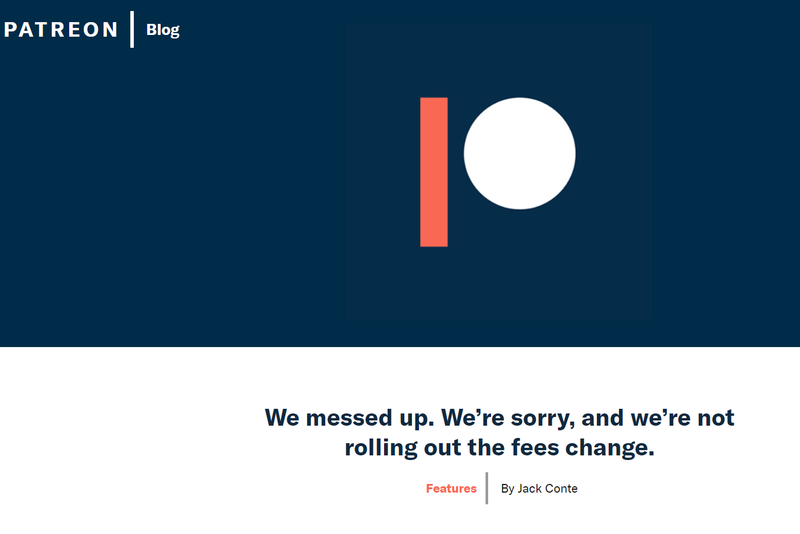 Patreon nearly instituted a change to their fee structure that would have harmed their users. One and two dollar donations were going to get hit with a high fee, deliberately discouraging small donations. This would have impacted the small and struggling creators using Patreon to get funds once a month. Thankfully, Patreon walked back this change. And that's all well and good. Do you know who doesn't forgive very well? Perhaps its the writerly camaraderie in me, but I always root for the little guy. The majority of writers are the little guy. We get by with little money and a lot of heart. Out there on the wide and tumultuous waters of the Internet, there are creators smaller than me having a tough time. I don't like seeing big companies stabbing the little guy in the back just so they can make a little more money from the millions they're already making. Patreon knew they would be hurting creators, and they just didn't care. They had it planned out so they would be making so much more money with this change than without it. Because I'm the type of person to take my business elsewhere, you may be too. Here are some Patreon alternatives out there. Kickstarter revived their Patreon competitor Drip last month. This is the closest one-to-one service to Patreon, but it's in beta at the moment. I would love to see my favorite creators on this service for a good reason, Public Benefit Corporation. Kickstarter put their money where their mouth was. This means Kickstarter legally looks after their mission, and does not allow profit to corrupt them. Patreon is a company who is getting a lot of angel funding. This means these investors want to see their investment pay off. What would that look like? Patreon making decisions that only benefit them and harm creators and users. Just like they did this past week. Ko-fi is a smaller service that has popped up from time to time. It's a really charming idea, support creators for the price of a cup of coffee, which is about $3. I put a button on the website because I like them so much. The most direct path to donations. You can even see one on this website. Anyone with a PayPal account can quickly and easily donate. You "They've adapted" Tube. Now YouTube pages can put on Sponsorships, replicating a Patreon or even a Twitch subscription. This seems to be replacing the donation box that no one ever used. Sadly, this feature is also in beta. Accounts can only create sponsorships after 1,000 subscribers. I use Patreon for YouTubers with a couple of hundred subscribers, so I hope this policy changes in the future. I would absolutely support creators directly on their YouTube channel. Hey team, if you're not interested in hard cash, let folks show their appreciation with buying you something. Are you interested in that book on Amazon? Don't worry about it. Steam sale around the corner? Here's a rogue-like. Now I'm going to be honest with you folks. It's early days for some of these services like Drip and YouTube. Some of these are very small like Ko-fi. Others are out of the way like PayPal. Besides all that, you can't expect people to follow you everywhere. I see this with my books. Nook readers buy on Nook, Kindle on Kindle, Kobo on Kobo. Exclusivity means people WON'T follow you. In that case, it may be best to put all your eggs on the Patreon basket. It is a simple and popular place to be. There are a few creators I support who I know won't be moving, simply because it was so long and difficult to get where they are. The chance they move and keep the same level of support is zilch. That's reality. Still, as I've seen in time and time again, diversify, even a little bit. Patreon succeeded because YouTube dropped the ball with creators. Prepare for Patreon to drop the ball in the future.